Whence the Mai-Tai? — Hey Vic, Step Aside for the Lady! Though the Mai Tai drink is mentioned in newspapers as early as 1955, the earliest extant recipe for the Mai-Tai is in a letter that ‘Trader Vic’ Bergeron wrote in May of 1956. Someone had written, apparently asking for the recipe for the drink she had encountered while at Bergeron’s Hawaiian establishment. 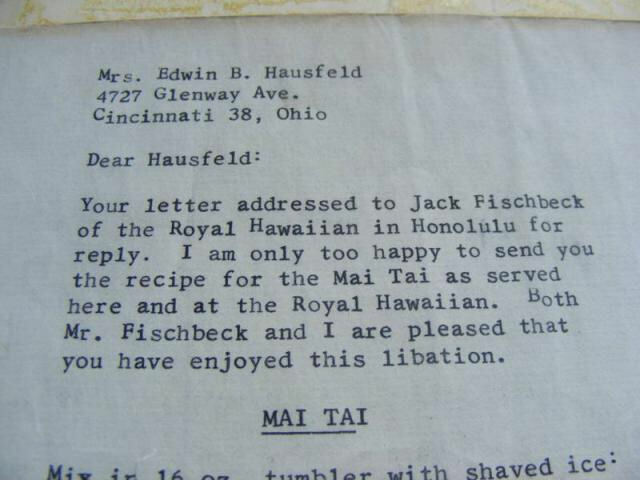 The sole subject of Vic’s reply letter is the Mai Tai drink, but he simply referred to it as “the Mai Tai as served here and at the Royal Hawaiian.” He does not in any way claim the drink as being his own creation in the 1956 letter. Around 1970, Bergeron did forcefully claim to be the drink’s originator, and that he had done so in 1944 using old, traditional rum (17-year old Wray and Nephew Jamaican rum). I have long suspected that Bergeron was being less than truthful in 1970. I suspect he mentioned a discontinued rum to allege an earlier creation of the drink. I further suspect that he put his own idea of the meaning of the name into the mouths of a couple of ‘white’ American friends to give the name a mythos that made sense to him while supporting his allegations. This couple allegedly spontaneously described the drink in Polynesian language (because they had supposedly in 1944 been visiting Tahiti) as being “mai tai,” and so on, as the oft-repeated-and-uncritically-swallowed story goes. Because he had such an obvious motive, and because to me his 1970 story claiming creation of the Mai Tai seems both a little too convenient and a little too contrived, I have doubted Vic’s honesty in this matter. So, I wondered what person or thing named anything like Mai Tai might have had enough cultural currency in no more than a decade before the earliest known mention of the drink and recipe in 1956. There are items in newspapers from that period that mention a cat being named Mai Tai and other items about a sailboat named Mai Tai. Both come in the middle of the 1950’s and before the earliest known mention of any drink bearing the same name. To me this suggests the possibility that the cat, the boat and the drink were all named after another Mai Tai. 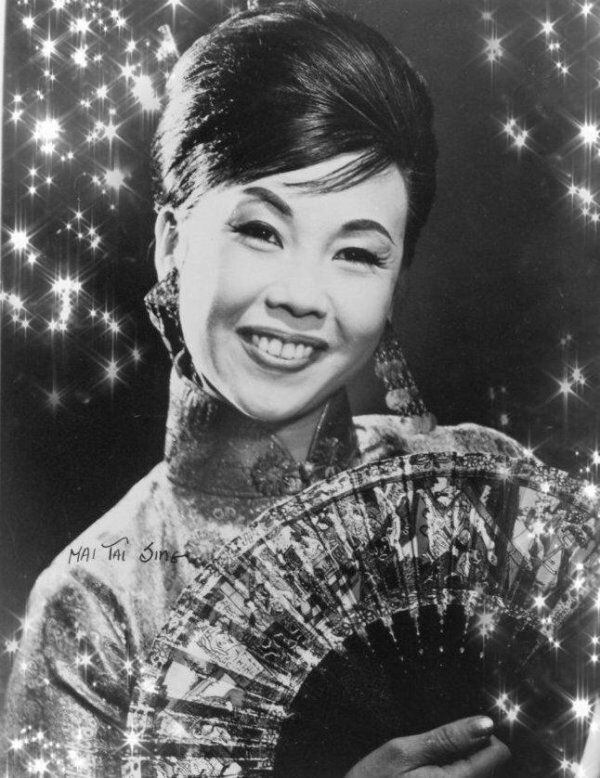 Mai Tai Sing was a Chinese-American dancer and actress. She was born in Oakland, California and in the late 1940’s was working as a lead dancer at the Forbidden City. She is pictured at center-top in the following photograph. 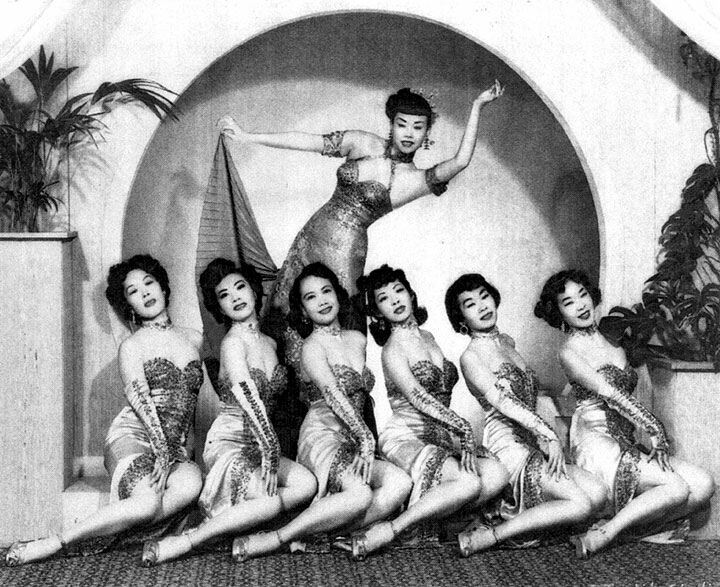 The Forbidden City was a Chinese-American-owned nightclub that was also a destination for those caught up in the post-war explosion of tiki culture. The place is specifically mentioned in work exploring the contribution of Chinese-American nightclubs to the development of tiki culture. Further amplifying her exposure at the time, Mai Tai Sing appeared as a dancer in the 1951 movie, the Golden Horde – and played the role of Soo Lee in 1953’s Forbidden (starring Tony Curtis). All of this puts Mai Tai Sing in the right time and very much in the right place – both geographically and culturally. After decades of managing nightclubs such as the Rickshaw in San Francisco and Trappers in the Hyatt Waikiki, Mai Tai Sing is now retired. She might be asked by someone if she remembers ever hearing that a drink had been named after her. Of course, it could have been without her ever knowing it. The evidence that the Mai-Tai drink was named after Mai Tai Sing is not conclusive in any way. It is circumstantial, but strongly so. It satisfies the need to show ‘motive, means and opportunity,’ so to speak. I also find it to require less of a leap of faith than to believe the account supplied very late in the day (1970) by someone (‘Trader Vic’) whose ego was clearly involved in getting the public to believe his story of being the drink’s creator (back in 1944, allegedly) instead of Don ‘the Beachcomber,” with whom Vic was was chief participant in a battle between two cranky, old men over past glory. I suspect that neither of them created the drink. I have a feeling that it was made by some unsung, non-Chinese, bar-tender working in a tiki establishment in the San Francisco Bay area some time between 1949 and 1953. My hunch is that the drink was good enough that it quickly outpaced the moderate and localized fame of its namesake — the beautiful Mai Tai Sing.